Lately, for me, Chrome freezes immediately after opening the ‘Open Dialog Box’ when attempting to attach a file to an email or during the process of attaching the file to an email. This can happen in any web application using Chrome when using the ‘Open Dialog Box’ (And possibly the ‘Save Dialog Box’. I have found (for me) that turning off Hardware Acceleration in Chrome fixes the problem. 2) Scroll to the bottom and click Advanced Settings. 3) Under the ‘System’ section, turn off ‘Use hardware acceleration when available’. 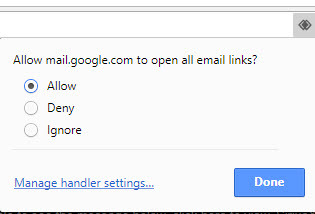 Add missing protocol mail handler in chrome settings manually in order to for a gmail compose window to appear when clicking a mailto:xxxxxxx@xxxxx.com link on a web site. 3) Under Privacy, click Content Settings. 4) Scroll down and click Manage Handlers. 5) If the mailto handler exists but is something other than gmail, the click the 3 dots and click Remove. If it is missing, do the following. a) Bring up your gmail in a Chrome Tab. Choose the ‘Allow’ radio button and click done. c) Go back to your Manage Handlers and the mailto handler should now be there pointing to mail.google.com. 1) Open the PDF in Google Chrome. 3) Click the Change button in Destination and choose Choose ‘Save as PDF’. 4) Click the radio button to choose your print range. 6) Follow the ‘Save As’ dialog box prompts. Okay, so I got this plugin for Google Chrome. 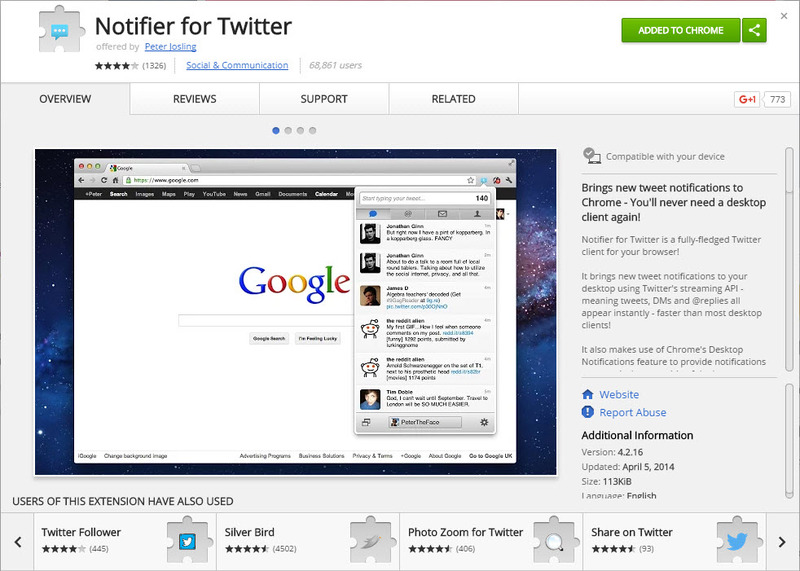 After a year of using the plugin, the Notifier for Twitter plugin stopped working. Clicking the tweets in the plugin worked okay. I tried everything under the sun. Within the plugin options, I clicked the Logout button, and then reauthorized the app. NOTHING! I uninstalled the plugin and reinstalled the plugin. NOTHING! I cleared my chrome cache. NOTHING! I uinstalled and reinstalled Chrome. NOTHING! I rebooted my computer. NOTHING! And worst of all? It works on my other computer that has the same operating system. I won’t bore you with everything else I tried. After 3 days, I decided to use the Chrome TweetDeck. I liked it except for the fact that I always had to have it up and running in Chrome to get my notifications, and I couldn’t lengthen the notification timeout to more than 2 seconds. Very annoying! I mean, I read fast, just not that fast. 1 week later, I decided to reinstall the plugin again thinking that maybe Twitter fixed something at their end. Sure enough, it DIDN’T work. After 30 minutes of trying other things, I FINALLY figured out the problem. The problem always existed (on my end), so it had something to do with a change to Twitter’s website that introduced the error. I remembered that the problem started happening when Twitter announced changes on February 7th, 2017. 1) I right-clicked the plugin and clicked Manage extensions. I then clicked the background.html link. 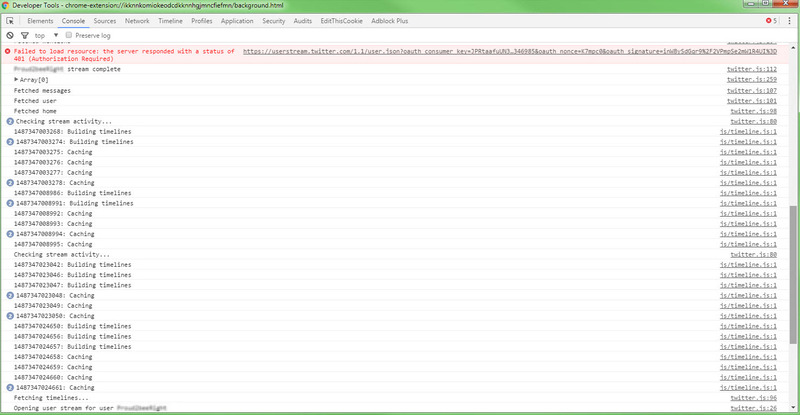 2) This brought up the Chrome Developer Tools Window. It was defaulted already to Console and was monitoring the extension. Low and behold….. a 401 Authorization Error???? Wait! What? 3) I then started Googling the issue, and upon my second website visit, I found the issue. The following (yellow highlighted part of the) sentence stood out like a sore thumb. 401: Authentication credentials (https://dev.twitter.com/docs/auth) were missing or incorrect. Ensure that you have set valid consumer key/secret, access token/secret, and the system clock is in sync. Could it be that simple? I do have an issue with the time on this computer that is connected to a network. The network time is 5 minutes fast, and every so many hours, the network does a sync refresh causing my computer to be off 5 minutes again. Nothing, and I mean nothing has ever prevented me from doing anything because my computer time was 5 minutes off. I have heard things not working because of the clock being more than an hour or day or year off, but not 5 minutes. I changed my computer time by decreasing the minutes by 5 to sync with the real time and wouldn’t you know it! UPDATED OCTOBER 11, 2012: Chrome 22 (released on Sept. 26, 2012) does not currently support our Download This Video feature. At this time, the only solution is to use Internet Explorer or Firefox for downloading videos with RealPlayer. Q: Why doesn’t “Download This Video” work in Google’s Chrome broswer? A: Chrome has recently been updated. Among the few changes that were rolled out in the update, Pepper Flash has been implemented to handle Flash video. You can learn more about the decision to implement Pepper Flash in this post from Google’s Chromium blog. As a result of the update, you may have recently started having problems with RealPlayer’s Download This Video button in the browser such as it doesn’t appear when viewing videos in Chrome 21, or maybe you can see the button, but nothing happens when you click it, the following steps should resolve the problem. In order to fix the issue, please do the steps in both sections and close and reopen Chrome before trying the download again. 1. Open a Google Chrome browser window. 3. Click the Details link in the top right corner. 4. The top entry should show three versions of Flash. Click Disable for the first one (you should see the Location listed as C:UsersuserAppDataLocalGoogleChromeApplication21.0.1180.60Pe perFlashpepflashplayer.dll). 5. Close, restart Chrome, and try downloading a video from your favorite video site. This article shows how to turn off Auto-Updates on Windows. To turn off auto-updates of Google Chrome on Windows, you need to instruct Google Update to not update it. Note: If the registry entry doesn’t exist, create it manually. Adblock is available for Google Chrome to block unwanted advertisement banners. The latest version of Google Chrome does not all for you redirect to your home page when clicking a new tab. You can get this feature by adding the old extension for making the new tab redirect to a URL of your choice. After installing, modify the extension to point to your URL. For example: www.google.com.